There is so much music competition show news this week …where do I begin? 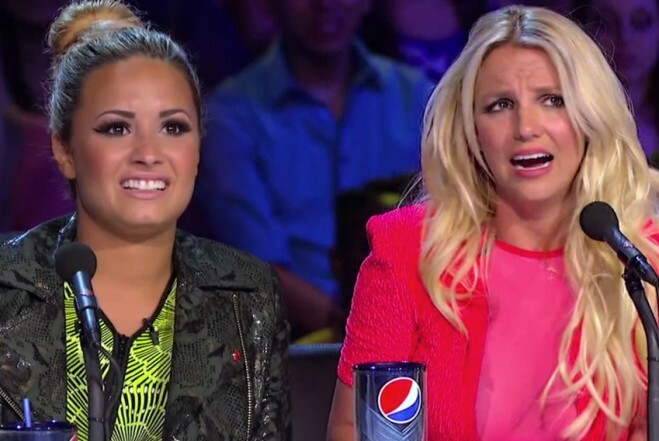 Well, Britney Spears will not be returning to “The X-Factor” next season. She decided to walk away with $15 million in her pocket and not come back. That’s what I call some good money for one season of work. Reports are that Simon is not crying over the news as he was hoping to get crazy Britney but ended up with boring (not so good for ratings) Britney. Simon was a winner however at the People’s Choice Awards with “The X Factor” taking home the Favorite Competition TV Show trophy and Demi Lavato grabbing the Favorite Celebrity Judge prize. Hold on to those accolades Demi, that award just might go to Nicki Minaj next year. After a preview of “American Idol” word is that Nicki Minaj is steeeeeeeeealing the show with her great energy, fun enthusiasm and likability factor. Go figure, she actually came across as the nice judge. What ??? I know!!!! Watch out Miss Mariah the limelight is definitely being shared if not stolen by Her Minajesty. The limelight will be shining directly on the beats this weekend as I brew up custom HK remixes of all your favorite hits. Get ready for wicked reworks on Britney and Will I Am’s new one “Scream And Shout”, Justin Bieber featuring the Barbs – “Beauty and The Beat”, Swedish House Mafia – “Don’t You Worry Child”, Ke$ha – “Die Young”, Neon Trees – “Lessons In Love”, Rihanna – “Diamonds” and Maroon 5 – “Daylight”! And that’s just getting the decks warmed up! Remember… If it’s hot, if It’s new and it makes you wanna move… You’re In The Mix with HK™! New Year New Music With HK!